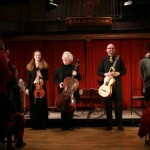 At the anvil (Photo provided by John-Francis Ellis). As the spring 2018 semester wrapped up in Steubenville, Ohio, most Franciscan University of Steubenville students headed home for the summer, returning to their seasonal jobs or perhaps to an internship. For John-Francis Ellis, a senior communication arts major at Franciscan, his summer began in front of a camera in Connecticut. 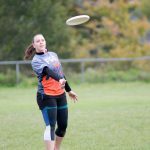 Ellis started the summer as a contestant on the reality TV show “Forged in Fire,” appearing in an exciting episode and coming close to winning the competition. Four contestants appear on the show at a time and go through four rounds of competition. 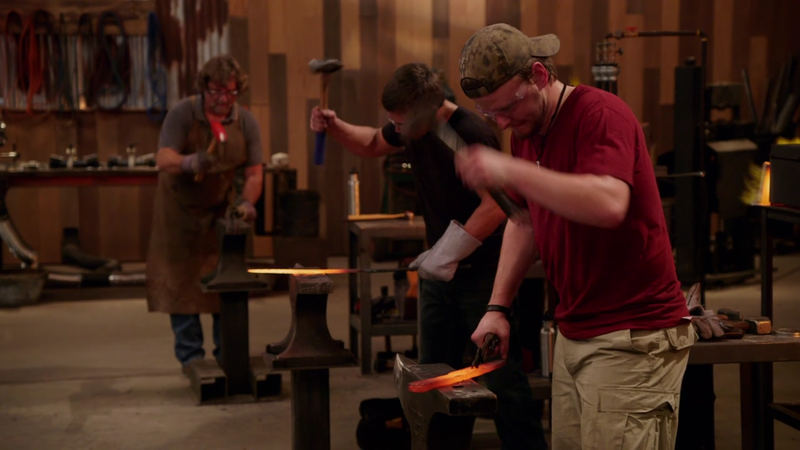 At the end of each round, one contestant is eliminated until one person is standing, who then wins the title of the “Forged in Fire” champion and a grand prize of $10,000. Grinding the knife (Photo provided by John-Francis Ellis). “I thought it would be a really cool experience to go and be on the show,” said Ellis. “I thought I could do well. I was confident. Unfortunately, I didn’t win, but I made it to the last round so I was really happy with that. When they first got in touch with me, I wasn’t too familiar with the show, but then I watched it a bit, and it looked like a really cool experience. So, I was like, ‘Hey, be on TV… why not?’” said Ellis. 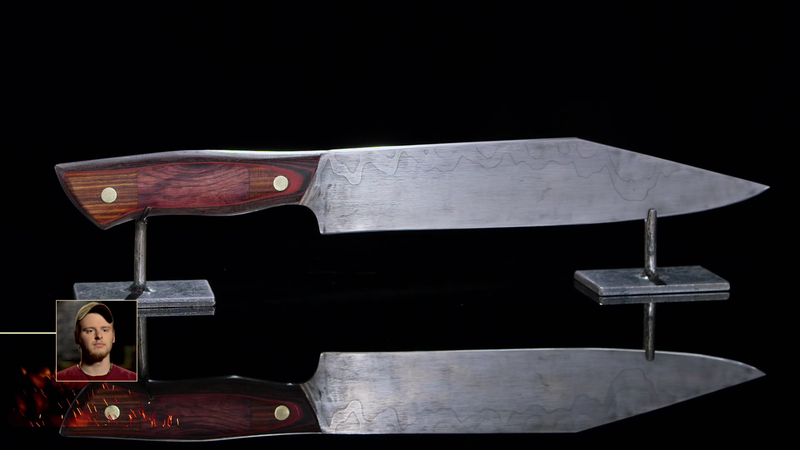 Forging has been a hobby for Ellis since he was 14 years old. “I first got into it because I really wanted a sword, but for 14-year-olds swords are kind of expensive. I thought ‘Hey, if I make it, it won’t be as expensive.’ But once you get all the tools and stuff it is kind of expensive” said Ellis with a laugh. The show was filmed in Stamford, Connecticut. The filming for Ellis’ episode, which aired on Sept. 19, 2018, took place during the months of May and June the same year. “A week or two after school got out, I flew up there,” said Ellis. Ellis made it through the first three rounds of the show until he and another contestant were the last ones standing. The fourth round started out differently than the ones before. “In the fourth round, you actually go to your home forge, where you have five days to make whatever bigger project it would be,” said Ellis. Ellis came very close to winning the show. The final competition involved making crossbows and using them to break panes of glass. Ellis’ crossbow broke through all the panes of glass, while his competition’s crossbow only cracked the glass. Even with these results, the judges of “Forged in Fire” awarded the championship to Ellis’ competition because his crossbow proved to be more accurate. 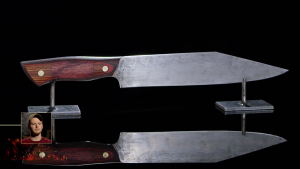 Final look of the knife (Photo provided by John-Francis Ellis). Ellis has an idea of what he wants to do after college, which involves both blacksmithing and his communication arts major. “I’ve always been trying to find a way to combine the com arts video side, which I really love, with the blacksmithing side,” said Ellis. Ellis sells products he makes and takes custom orders. He is happy with his performance on the show “Forged in Fire” and looks forward to more blacksmithing in the future.